Chef Bee Satongun and chef Jason Bailey are not just spouses, but professional partners too. After 16 years of cooking exclusively Thai food professionally, they opened their first outlet of Paste Bangkok Thai restaurant in 2013. Their rigorous attention to detail, technical expertise and flair for presentation allows them to create refined Thai food with unique, layered depth and complexity. The menu at Paste is essentially heirloom creative Thai cuisine, based at it’s core on numerous old Thai family recipes from 19th and 20th century. The plant-based dishes center on rare Thai produce from all over Thailand, accompanied with the highest quality meats and seafood. Each dish is developed and focused to deliver layered textures, clean and bright natural flavors, and presented with carefully designed composition of ingredients. The creative conclusion of these layered flavors is the signature trademark of this chef duo. Paste restaurant is crowned with a Michelin star and is considered to be one of Bangkok’s best restaurants, representing a study in Thai culinary history. The couple has spent years painstakingly studying and chronicling the evolution of Thai cuisine, discovering century-old recipes and long-forgotten techniques in the process. 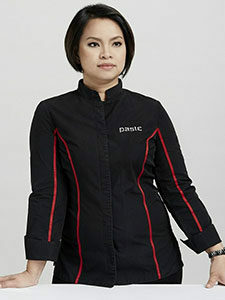 Except the recognition from Michelin, Chef Bee Satongun was recently awarded Best Female Chef in Asia, 2018 and Paste was recently listed as one of Asia’s 50 Best Restaurants for 2018.